Over the years, the Procession of the Giants and Bigheads has become one of the symbols of the San Fermin fiestas. These characters are dearly loved by the people from Pamplona, who are present at the procession year after year. The four pairs of giants form a court of kings, escorted by the Cabezudos or bigheads and the Kilikis, representing the local authorities, and the Zaldikos, which means horses in the Basque language. In all there are 25 paper mâche figures who enchant children and adults alike with their dances through the streets of Pamplona during the mornings of the fiestas. 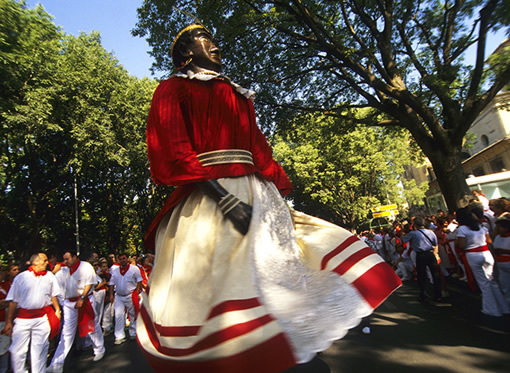 The Procession of Giants and Bigheads has been present in all the important celebrations in Pamplona since the 16th century. In the 18th century, this tradition was lost, only to be recovered a century later thanks to the six giants kept in the Cathedral of Pamplona. The present-day paper mâche sculptures of the giants were created almost one hundred and fifty years ago. Precisely in 1860, when the City Council commissioned Tadeo Amorena to create 4 pairs of Giants, a king and a queen for each of the continents: America, Africa, Europe and Asia, with the exception of Oceania, of which nothing was known at that time. The dancer supports the figure on his shoulders, bearing a weight of 59 to 64 kilos, whilst he dances. It is surprising to see how these enormous figures, which reach heights of 4.20 metres when lifted up onto the dancer, move with such agility and elegance. The giants appear to come to life to the tune of the Pipers from Pamplona - Iruñeko Gaiteroa. Toddlers give the giants their dummies, which hang from their enormous hands all morning. The Bigheads or Cabezudos head the procession, young people dressed up and carrying a large head, representing the authorities, looking serious and walking solemnly. There are five Kilikis known as the Councillor, Grandmother, Mayor, and Japanese couple (man and woman): They simply shake hands with any child asking them to do so. They are the work of the Pamplona artist Félix Flores who created them in 1890. The Kilikis can be differentiated from the bigheads because the latter carry a sponge and stick and are out to hit the children. All wear a tricorn hat and their grim faces frighten the children , who they chase and try to hit. The children entice them by shouting"¡kilikiki! ikilikiki! ¡con el palo, no; con la verga, sí!" (not with the stick, but with the sponge). They are named Ponytail, Potato, Beard, Warts, Napoleon and Vinegar face. 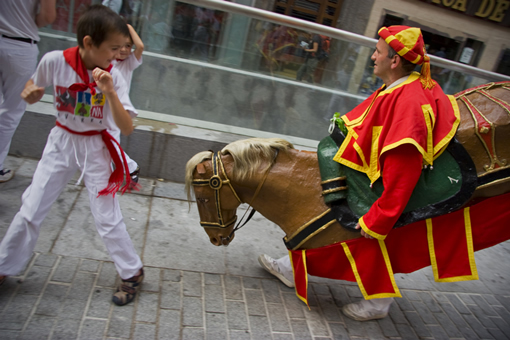 The Zaldikos which means horse in Basque, simulate riders mounted on horses who chase after the children with their sponge and stick. The Procession leaves the bus station every morning at around 9.30 am, except for the 6th July when it leaves at 16.30 pm to parade around the streets of the Old Part and the new extension (Ensanche), with a different itinerary each day, although always starting and finishing from the bus station. To find out which streets the giants will be in each day, it is best to look in the local paper. On the 14th the last dance takes place at the bus station, this is a very moving ceremony in which the people from Pamplona have named Saying farewell to the Giants (Despedida de los Gigantes).